ReWalk allows paraplegics to walk, almost the same as an able-bodied person. A forward tilt of the upper body triggers the first step and gets the system going. There are several other exoskeleton systems in development, by ReWalk is the first to receive FDA approval. The system has been extensively studied and tested in Israel, the US, and Europe, and is in use by people around the world. In addition to providing wearers with the ability to stand and walk independently, clinical studies show that using the ReWalk provides significant mental health benefits as well, with users having a much more positive self-image as they gain independence and control over their movements, according to experts who have studied the system. While it solves a much-needed problem, the market is limited; out of about 250,000 Americans with spinal cord injury, about half would be able to use the ReWalk exoskeleton, assuming their insurance could pay for it and they did not have other conditions preventing them from being active. But the technology developed by Yokne’am-based ReWalk can do more than help quadriplegics walk; it can make it easier for millions who are mobility-limited to get around without the wheelchairs, walkers, and other apparatus they currently require. ReWalk has been working with Harvard University’s Wyss Institute for Biologically Inspired Engineering to develop ReWalk-based systems for individuals who have lower limb disabilities, but are not necessarily paralyzed. Last week, the company announced that the Harvard organization was licensing ReWalk’s technology to develop such systems. 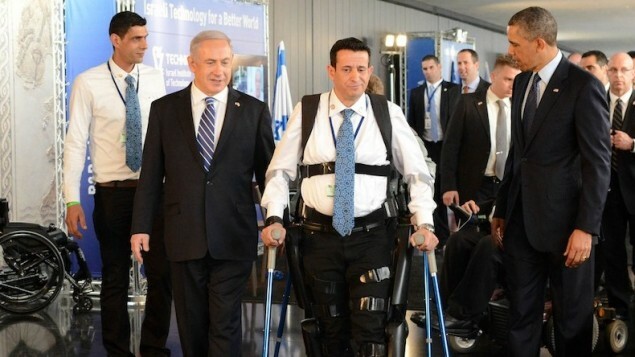 Described as “soft suit exoskeleton technology,” the system uses fabric-based designs that attach to the legs and feet to transmit power to key joints of the legs with cable technologies, powered with software and mechanics that are similar to the technologies used in the ReWalk system. The system is a lot cheaper than a ReWalk exoskeleton, which provides more assistance and technology than many partially disabled people need. Initial pilot studies with stroke patients run at Wyss, in collaboration with faculty and researchers from Boston University, have demonstrated the efficacy of soft suit exoskeleton technology. ReWalk will work in concert with the Wyss Institute on the continued development of lightweight designs to complete clinical studies, pursue regulatory approvals and commercialize the systems on a global scale. The first commercial application is expected to be for stroke patients, followed by one for MS patients. There are an estimated 3 million stroke patients with lower limb disability in the US, and approximately 400,000 individuals with multiple sclerosis.